Hola kitties! Guess what? We had tons of bloopers and stupid human tricks in the condo last week. I can't wait to tell you about them. I have a foto frenzy blooper and some foto fails for you too. First Pop "hooked up" our new printer HAH! Then came the water stupid human trick. Since this post has gotten super long, I'm gonna save the new printer until next week. TW likes bottled spring water cos she doesn't trust what comes out of our taps. She also likes spending Pop's hard-earned money. Last Saturday the peeps bought a couple of cases cos the store brand was on special. TW waited several hours before she took them out of the cart and when she did she noticed a puddle in the bottom of the cart liner. Nothing registered so she put the cases on the floor and started to go about her business. Uh oh! FLOOD! I'm sorry to say I wasn't the one that noticed; she did. It was easy to find the bottle with the split but before they got it in the sink, half the water was on the floor. It didn't help that TW squeezed the guts out of the bottle to get it out of the plastic. Sorry, no pics. Foto Frenzy #1778 from May 2011 is a real blooper/foto fail. This is actually the third foto from this short set that has been chosen. TW doesn't take too many fotos when I'm on the window in Pop's room. What's makes it a foto fail? TW shot into the light so I'm just a shadow of myself. You can hardly make out my stunning face! BUT, it's the best of the bunch. What makes it a blooper? TW had the camera set wrong. The actual size of the high res is 3.5 x 2.6. I think she was trying to cram a million shots on the camera's SD card. Either that or she was hired by the post office to make some new stamps. Thanks to Kitties Blue for the suggestion. 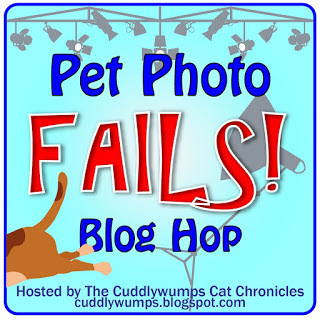 I got some recent photo fails for you too so I'm joining the Pet Photo Fails Blog Hop hosted by Miss Cuddlywumps for the Cuddlywumps Cat Chronicles blog. 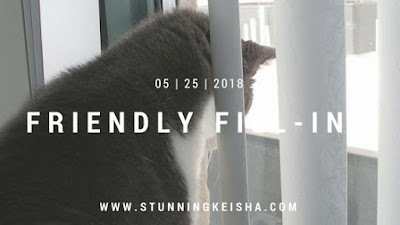 This new blog hop takes place on the last Friday of each and every month. Everyone has an occasional photo fail so you should join in the fun. This one needs no innerduction. I was so through with this foto shoot and the food. There's motion blur and both the set and the background are a total mess. We did get a few usable pics but certainly not this one. This one is even worse. TW couldn't attend Blogpaws this year and was feeling that all the other cat bloggers hated her cos she didn't go every year and she hadn't bonded with anyone. She's a loner and very private human so it's hard to get to know her like I do. Then we received this pawsome card in the mail from … those same cat bloggers who obviously don't hate her. Needless to say, TW was a puddle of tears and wanted to thank everyone so she grabbed the flashy box to take some pics. Hello! She didn't look to see if the flash was on—it wasn't—and this is what she got. Seven of them. Of course, I refused when she axed me to pose again for a re-shoot. If the foto wasn't blurry and she could save it, she would have cropped out the clutter in the background. She's good at that. The Friendly Fill-Ins are hosted each and every week by 15andmeowing and Four Legged Furballs. They think up the fill-ins and I fill in the answers. My answers are underlined and in italics. Each week my image relates to one of the fill-ins. This week it relates to number three. 1. It is what it is. I've always wanted to say that. Heh. That said, it's Memorial Day weekend and it's finally beginning to feel like summer. It's also the start of Pop's staycation. Yay! 2.The best part of last week was Aunt Pauline came home from the hospital and TW talked with her. Otherwise last week was rather crappy between the weather, the next door neighbors and my blog numbers tanking to new all-time lows. Then there was the GDPR fiasco. 3. Every summer, I spend more time on the window sill cos the new season of Burd-tv starts. At four or five a.m., I start to hear them chirping away. While I'm ogling their fat, juicy bodies, I can also catch a few rays. We actually have sun puddles on the window sill during the summer. 4. Once upon a time, TW actually worked and we thought we were set for life. Now that isn't the case. So there you have it—bloopers, stupid human tricks and photo fails. If you want to really embarrass TW, share this post to your social media. Heh. Those are some good bloopers! Can you believe that my human is just starting on the whole GDPR thing today (Thursday)? At least she is getting it done, although I'm wondering if I should hire a new webmaster. 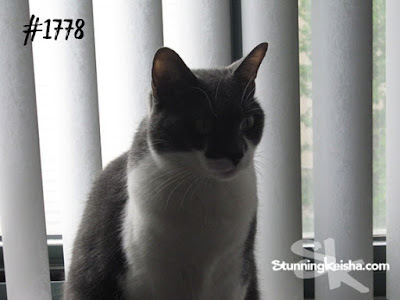 I has tons of blurry fails - and dere are all my "eyes closed" photos. Enjoyed your fotos. We have lots of blurry ones, too! My father worked for the same company for decades, then 1-1/2 years before his retirement, they forced him out. It broke his heart. I learned from his experience that it's every person for themselves now, but it's scary out there! Am even considering dying my hair, to hide the evidence that I'm not 25 years old. Have a good weekend! You make bloopers look so stunning, CK! 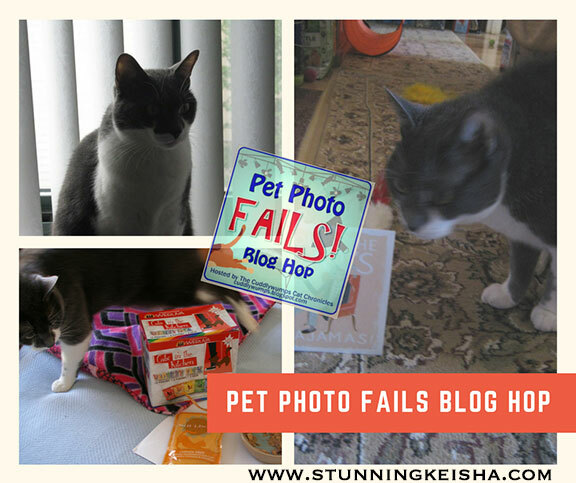 Thanks to this here slacker of a human, we didn't get set to join in on the Pet Photo Fails blog hop this time around. We'll do better next time, though! And your fill-ins are fantastic, as always, CK! We are still sending lots and lots of purrs, woofs, and prayers to Aunt Pauline. P.S. This here human has never had any leaky water bottles. But, she once came home from the store with two dozen eggs, every last one of which she dropped on the kitchen floor. This here human is messier than those eggs were. I'm glad Aunt Pauline is home from the hospital. That was a very nice card you got from your blogging friends. My Kindle is dying on me so I can't visit as many blogs as normal. Hoping to get a new one soon. Great blooper photos too. Have a good weekend. We never think your blooper photos are very blooper-ish. Perhaps you could teach our Mom your photo skills since she's always clueless when it comes to lighting, or lack thereof. Great fill-ins! We think number 1 definitely applies to your humans water trick! You look fabulishious...even if you think you are a fail...And the water thing...Mom had a floating trunk...all the groceries got soaked and a few boxes had to get turfed...mom was happy that it was not something that was a bright color or sticky! Even your bloopers look good to me. I am glad I have a well, but my Mom buys water in gallon jugs and makes them bag each one just in case it leaks. Does she always get the same brand? Maybe you would drink a different one. Well those were fun CK and so were your fill in answers. Tell TW the Dad always enjoys seeing her at BlogPaws in the rare event he goes! Loved your pictures even the bloopers. Nice to see others get blurry photos and faceless cats. That dang light at the wrong angle wrecks everything. TW sure has the adventures, doesn't she? I'm good at cropping out crap, er clutter, too...except for in our bloopers today! Um...#4? That's our life too. We had the rug pulled out from under us, and have been faced with a whole new reality. It is not a good thing, but we're plugging along! We sure understand how tough that is. We're with ya on #4......and...your "fails" don't look like fails to me! Great bloopers, CK, We have a whole computer full of them. :) It is what it is....that’s the mom’s motto...she says that all the time. This incident reminds me of your poorly-house-trained Fir from a few years ago. TW isn't alone. This past week, I used a scissors to open a pack of water bottles and ended up slicing through one of the bottles ... talk about a mess! CK those were excellent bloopers! 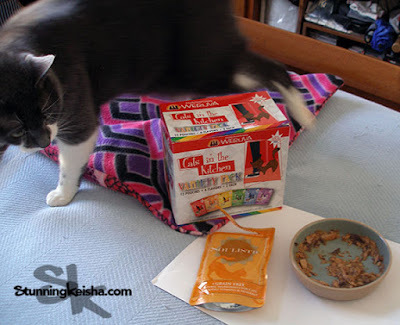 MOL excellent bloopers!!! Mommy hid some kitties in our art work Saturday just for you. What a fun new blog hop! Great entries! 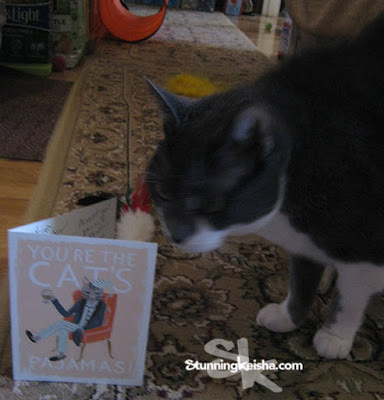 That was very sweet of the cat bloggers to send the card.